The new nature bridge in Kallhäll, Stockholm. Credit: Mikael Ullén/Trafikverket. A ‘landscape’ bridge has been opened in Stockholm, providing a corridor for wildlife to safely pass over the railway. The 63 metre-long bridge is situated in the suburb of Kallhäll and connects a large residential area with Görväln Nature Reserve. 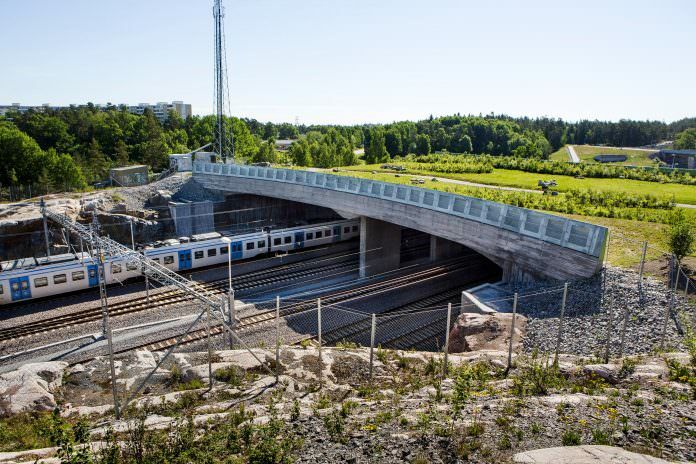 The Swedish Transport Administration Trafikverket said that as well as serving as an extension to nature with meadow plants growing on its surface, the bridge has been opened to make it easier for members of the public to get to the reserve. The 60-metre wide bridge passes over the Mälaren line, which is currently being expanded from two to four tracks between Tomteboda and Kallhäll. Trafikverket made the announcement on June 3.